Inside Baseball Operations – Do You Want to Work in Baseball? 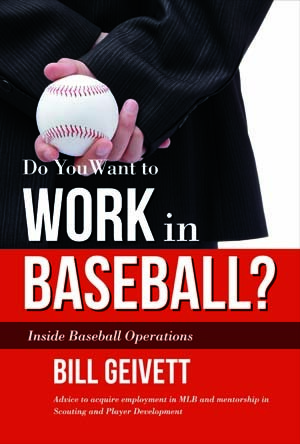 Bill Geivett’s- Do You Want to Work in Baseball? Do you want to know the process of acquiring employment in MLB? Have you wondered how baseball scouts evaluate players? Do you want to know more about professional baseball Player Development? Bill Geivett draws on his 28 years of experience in professional baseball to answer these questions. He offers his insights from his time as a player, scout, and front office executive. Do You Want to Work in Baseball? is more than a “how to” description of details to remember. It is filled with Bill’s real-life lessons learned from the varied roles he has held for Major League Baseball Clubs including the California Angels, New York Yankees, Montreal Expos,Tampa Bay Devil Rays, Los Angeles Dodgers, and the Colorado Rockies. For anyone who desires a career in Major League Baseball or any professional sport, as well as, athletes, parents, and fans, Do You Want to Work in Baseball? is a unique practical look into a world that only a few have seen first-hand.